I don’t know about you, but in my past homes, the dining room was beautifully decorated, but rarely ever used. I always feel like that is such a waste of a room. So when we moved into the house, the dining room was one of the rooms that we did the most work on. When we bought the house, the dining room had a venetian plaster ceiling, a chair molding around the perimeter of the room, different draping and other details that I just didn't want. I was so excited to be able to redesign this entire space and create a more casual dining room space. We had some really cool ideas that I knew I wanted to incorporate into this space. 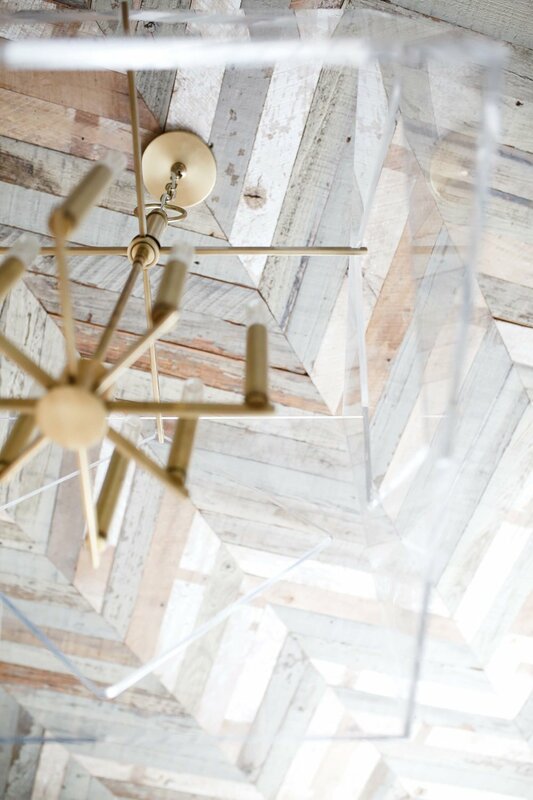 One of those ideas was a reclaimed wood ceiling. I loved how it not only adds a unique flair to a room, but it feels like a work of art that doesn't take away any part room. I have a really great carpenter that has done a lot of work in the house over the years and he is also a very creative. He was so helpful when we were coming up with ideas on how to arrange the wood on the ceiling. We came up with a chevron pattern. My husband and I went to a place here in Nashville called Woodstock Vintage Lumber and it is such a neat place if you ever get an opportunity to go. They have so many different woods salvaged from barns, factories and old buildings on the property. It's so cool. The wood for my ceiling came from three different tobacco barns that were originally in Nashville. Some of the wood pieces have a white finish on them and some have grey. The different colorations really make the pattern pop and give a lot of depth to the room. Not only is it beautiful, but it is such a great talking piece whenever we have guest over. This ceiling is my own Sistine Chapel, I love looking up at it. The chandelier was the first thing I bought for the home. I was on an airplane to Nashville, coming back to see the house for the second time and I saw the light fixture in a magazine and fell in love. 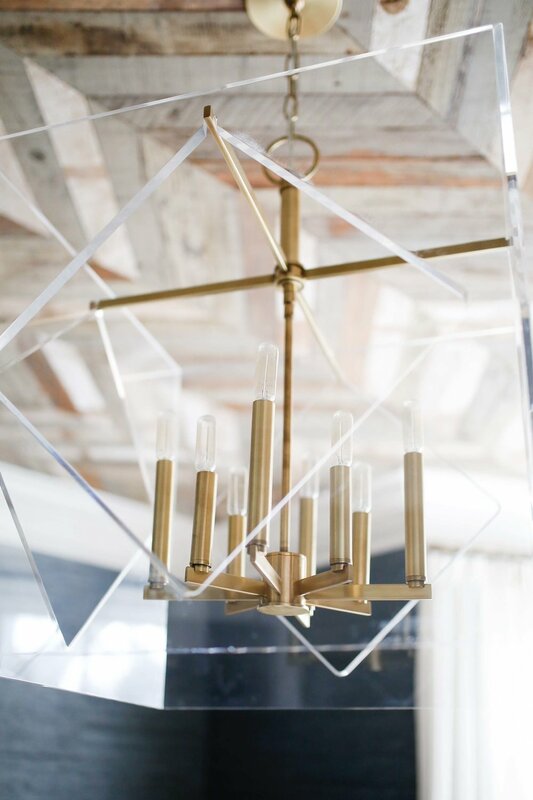 I loved the brass and acrylic (you’ve seen my closet, I still love that combo). Before we touched anything in the house, I bought that chandelier. 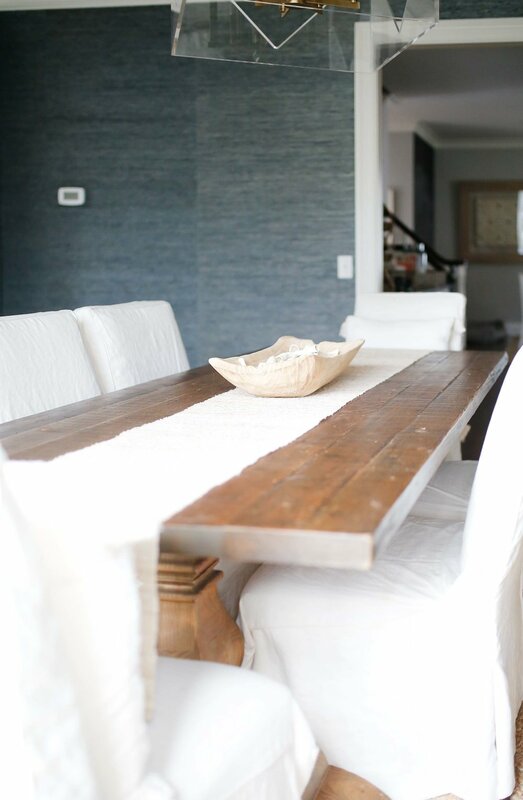 I knew I wanted a more relaxed + modern style in the dining room, noting too formal. Most people only use their dining rooms for special occasions like Christmas and Easter, but I wanted my dining room to be a space that was very welcoming if we happen to have a few more guest than our kitchen table can hold. 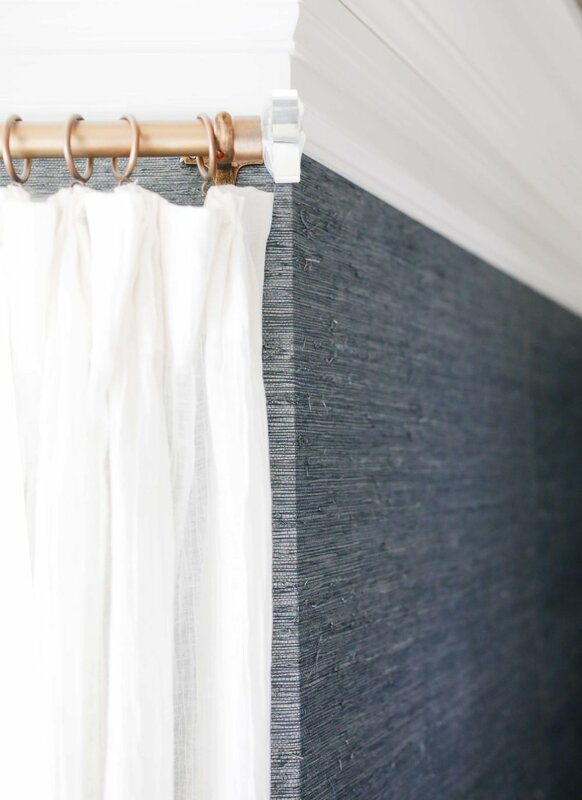 Another detail that really gives this room character is the grasscloth wallpaper. It reminds me of a good pair of blue jeans. It has a little bit of a distressed look but it is a great shade of navy. It is Phillip Jeffries and I am so obsessed with it that I put it in my powder room too which you will see later in the home tour! I wanted a very light and open dining room, so we just got some brass curtain rods with an acrylic accent end to tie in with the chandelier. The curtains (similar) are light and sheer and go all the way to the floor and puddle. They were a custom fabric I ordered through Studio M Interiors. We got a barn wood style farm table that matches with the ceiling. I love the look of slip covered chairs. Having white chairs is a risk when you have kids in the house, but you can just slide the slip off to wash or spot treat. I haven't regretted it one bit. They really give that, hey, come sit down on me kinda feel. Very relaxed and inviting. I got an etagere, which is a fancy word for an open wall unit which I keep really simple with a few art sculptures or some books. I have found that TJMaxx and HomeGoods are really great resources for things like that when you are trying to fill a space. The buffet is a brassy gold color that I think looks great with the rest of the room. 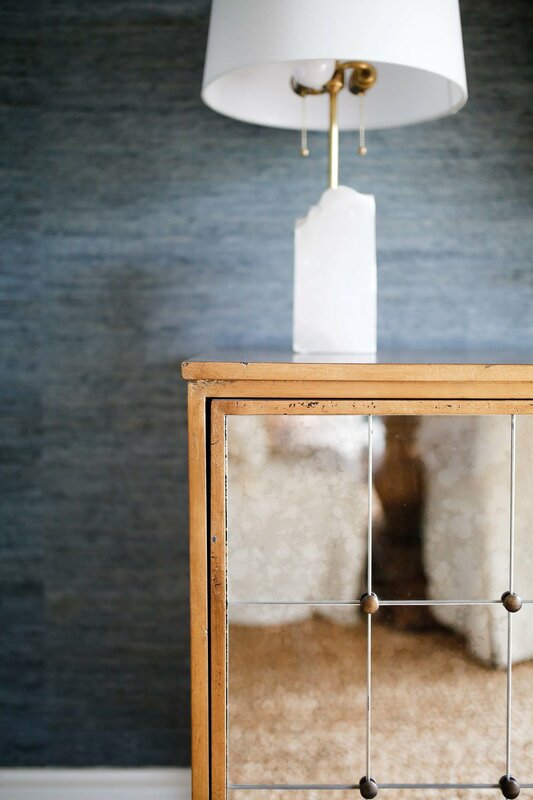 The antique mirrors reflect the design of the room and make it feel bigger. 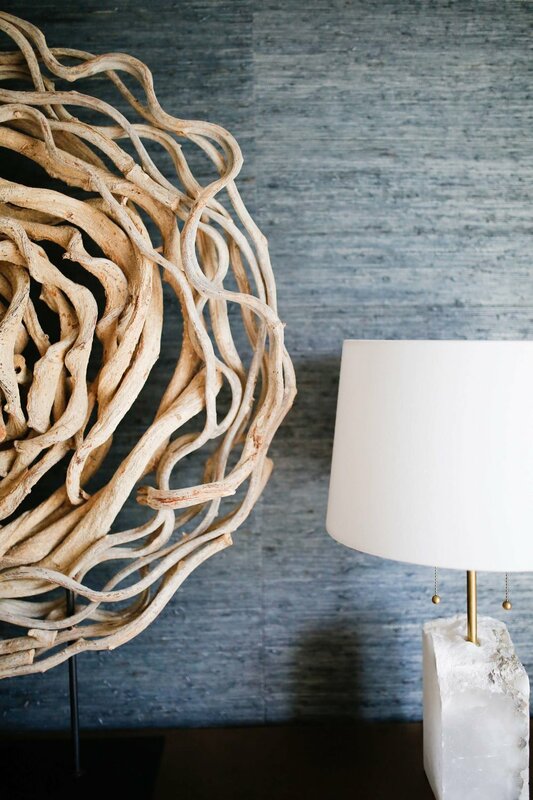 I am sure you already knew, but Annie Graunke from Studio M Interiors was a huge help when picking out the larger furniture pieces in the room. We put two alabaster lamps on either side of the buffet and the really unique centerpiece was something I found in a local consignment store here in Nashville called The Shoppes of Belle Meade across the street from one of my favorite gifts + pape store, You're Invited. I got it for around $60 which was a total steal. I think it is a really cool piece that draws the eye into the room, but doesn’t overwhelm the view. On the floor I just have a large looped sisal rug that blends in nicely but adds a touch of comfort. The dining room is easily one of my favorite rooms. Funny enough, before I had an office, the dining room was where Living With Landyn was born and where I spent most of my time writing post. It was and still is just a nice place to sit and look out the window at the front yard. I love having a dining room that is livable rather than just a room off to the side that is rarely used. I hope you love it too!